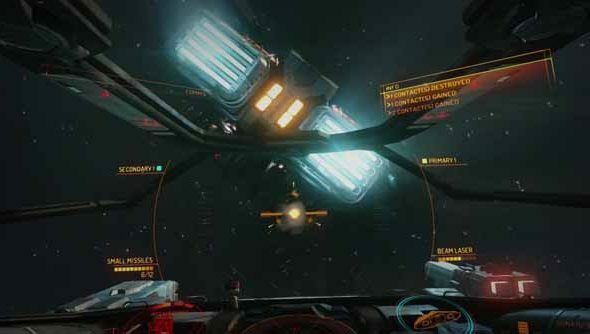 Earlier this year Frontier Developments updated the Elite: Dangerous alpha, as it was then, with station-docking. Players were tasked with flying spaceships through letterboxes, and lo, Elite became one of the best space games on the PC before it was finished. But months later, it’s reasonable to ask: what precisely are we docking for? Elite’s new standard beta version answers that question with the addition of fuel, and new systems to burn through it in. The developers have also incentivised purchase with a less house-mortgagey asking price. Elite: Dangerous beta access used to cost $150 – an artificial bottleneck tighter than the entrance to one of those stations. It’s now $75, and there’s much more to play with. Ships will now burn through fuel, which seems sensible if Elite: Dangerous is going to have the complex trade economy David Braben is determined it will do. The fuel gauge is something you’ll need to keep an eye on if you intend to explore the entirety of the beta’s newly-embiggened play bubble. Players now have access to around 50 systems over a 21 lightyear radius. Feature-wise, Frontier have implemented new text chat, voice comms, support for friends management, and a matchmaking system that brings pilots through the same jump to a specific island. That’ll help keep players together in the vastness of space – as will a galaxy map updated with trade routes and system connections. The full changelog mentions new AI Imperial Fighters and smuggler behaviour, so watch out for that. You can tackle them with the new Viper or Lakon Type 6. Have you bought into Elite yet? That price still isn’t very accomodating for young traders looking to start on the pilotry ladder, is it?